Many humans wonder why dogs hate bunnies. The answer is clear and simple, dogs hate any intruders who come into their territories and bunnies are the worst invaders of all. No matter how many times you chase them away they always return cottontails held high like they own the place (as a matter of fact they don’t!). They eat all the plants in my human ladys (Lady Charge’s) garden (not that I really care but I feel sorry for lower life forms when something doesn’t go right for them witch is a lot). As if invading and eating the plants in the garden isn’t enough they also leave there disgusting droppings all over the yard! And let me tell you it is not a pleasant surprise to step in one of those little gifts! The worst thing about bunnies by far is that they always get away with every one of these little pots to ruin my humans and I’s life because they are so darn fast that they are impossible to catch! If I could ever catch a bunny then they would be taught a lesson to stay out of my yard! Many times I have caught bunnies red pawed eating all the plants in Lady Charges garden. Lady Charge doesn’t like it when I go in her garden because I run through the flower beds and pluck her gardening gloves. I do it anyway because it is quite amusing to watch humans get angry! I am always chasing those big eared nincompoops out of the garden but they escape under the fence ever time. I hate fences almost as much as I hate bunnies because they are always getting in the way. I have never gotten the bunnies to fully leave the garden alone but I sure have scared the living daylights out of the a few times! Another terrible thing that bunnies do that I mentioned is that the poop all over the lawn. This part of bunnies I don’t mind so much because I do enjoy eating bunny poop but for my humans this is torture. They are forced to look where they are going when they are trying to play just so they don’t get their shoes nasty with rabbit dung! Bunnies find watching humans step in there poop amusing because I heard some of them laughing about it after my small human girl got her shoes covered in it. Don’t worry about them though I chased them off and hopefully they won’t be pooping on the lawn for a while for my humans sake. The by far worst thing about bunnies it that they get away with all their evil schemes because they are much too fast to catch. I chase bunnies ever time I get the chance hoping that perhaps this time will be the time I finally catch one of those clover munching scoundrels but it never is. The only time I have ever gotten close to teaching a bunny a lesson was when I discovered a nest of baby bunnies in my backyard. Even then I wasn’t able to get back at the bunnies for making my life a constant work because my humans found out what I was doing and covered up the nest. I really don’t understand humans, if they hate the bunnies to then why don’t they let me teach those little fluff butted creeps a lesson for once. I hope you know understand why dogs hate bunnies so much. They are constantly eating the garden, leaving their disgusting droppings on the lawn for my humans to step in, and they never get what they deserve for all the unspeakable things the do. 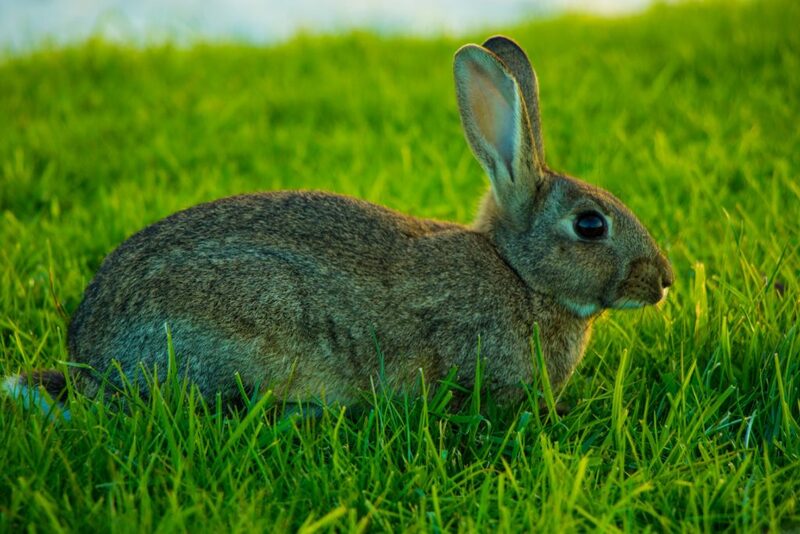 I also hope you consider letting your dog teach bunnies a lesson if they have a chance, because your garden would probably be a whole lot greener if those big eared jerks weren’t always munching on it.